The patchwork carpets, which are also unique items, are all handmade by cutting and expertly re-sewing vintage carpets, which are, then, dyed with monochromatic vegetal dyes to create a range of bright hues and soft natural shades. The patchwork technique enables carpets to be produced in the desired dimensions and assembled to achieve the desired final visual effect. 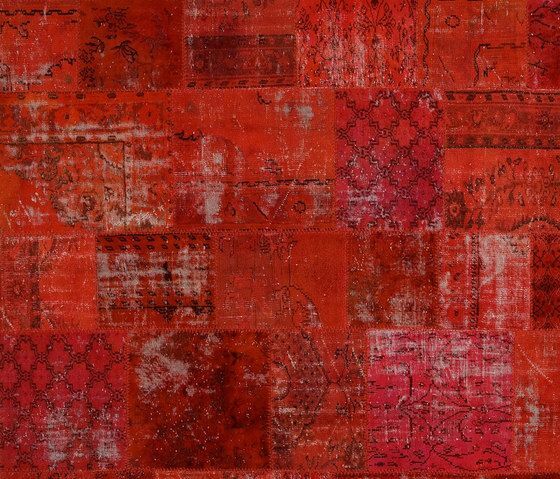 In practice, patchwork starts from the detail to finally reach the general composition, highlighting the charming decorations and textures of oriental carpets. All processing stages are manually performed with precious yarns, consistently with the ancient art of embroidery. With the Decolorized line of classical carpets, which are decolorized and re-dyed, the Carpet Reloaded collection offers an innovative living trend that is also extended and developed with a creative experimental approach in the Patchwork line.